The gameplay will feel familiar to those who have played EFMB or Stamp Quest, but now as Mobius you must collect Spectrum cassettes from eight single screen stages whilst avoiding the baddies. 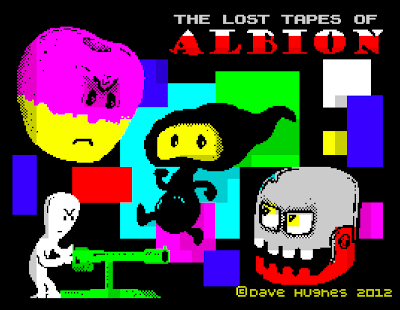 Unlike EFMB, The Lost Tapes Of Albion doesn't feature procedurally generated levels and all eight of these use the same layout. Also, rather than the 'die on a level = go back a stage' the progression here is much more straightforward. You have 30 lives to get through all eight stages - and you will need them. Rest assured, all your favourite baddies are back! The ones that look like they've escaped from Bubble Bobble, the homing ones, the ones that shoot at you, the Attribute Snake – and now there is a new giant sort of baddy that is as spectacular as it is devastating. 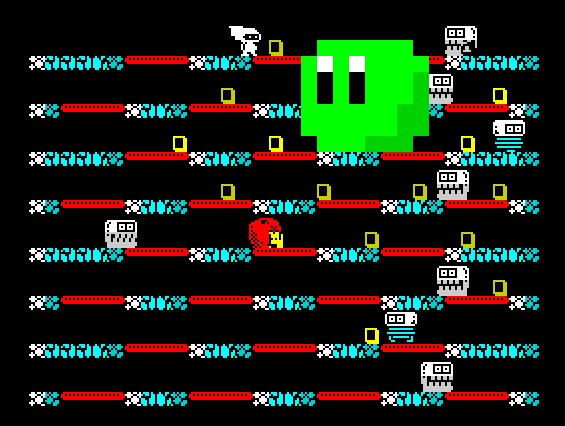 Avoiding the array of enemies is a brain melting game of using the teleporters to jump between levels (including off the top/bottom of screen) and the weird level wrap at the left/right edges of the screen between platforms. Frantic stuff! 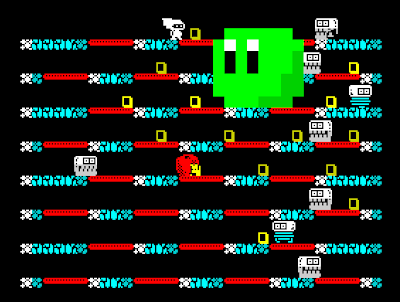 Eight stages might not sound a lot, but by level six the screen is chaotic with enemies of different types and avoiding them is nigh on impossible – but you will persevere, eating through your reserve of 30 lives, because as well as being ultra-addictive, the game also rewards each completed stage with a (multicoloured) image of a 'lost' Speccy game and description – these are genuinely funny (at least on the first time through) and provide that extra motivation for getting to the end. Completing all the stages gives a lovely closing animation that I shall not spoil here. For all the charm that The Lost Tapes Of Albion oozes, there is a certain hurriedness that threatens to spoil things – such as very occasional collision issues, a spelling mistake and the slightly awkward text pagination. The similarity to previous games could also be seen as a bit of a problem – although there is enough of an identity here to let this game stand on its own – and The Lost Tapes might well be some people's preferred offering over EFMB for its more structured approach.